January 21, 2014  Even those who support decriminalizing marijuana were careful not to claim that Obama's remarks had altered the overall political dynamics of the debate. 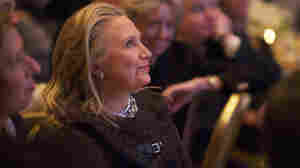 December 8, 2012  A video tribute to Secretary of State Hillary Clinton last weekend convinced New Yorker Editor David Remnick that Clinton is planning to run for president — despite all claims to the contrary. July 15, 2008  Is the most-recent cover of The New Yorker good satire?